The leadership of the lower house of the Brazilian Congress has moved to accelerate the impeachment process against the country’s President Dilma Rousseff amid continuing street demonstrations both against and in favor of her ruling Workers Party (Partido dos Trabalhadores—PT). Friday saw demonstrations in every state of Brazil in defense of Dilma, as the president is universally known, and Lula, ex-president Luiz Inácio Lula da Silva, the former metalworkers union leader who was a cofounder of the Workers Party over 35 years ago. 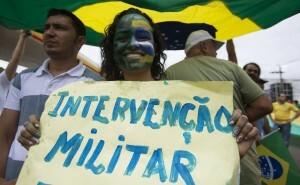 While the CUT trade union federation, one of the main organizers of the demonstration, claimed that 250,000 people rallied in downtown Sao Paulo, Brazil’s financial and industrial capital, and another 50,000 reportedly took to the streets in Recife to the north, the demonstrations, dominated by the PT officialdom, the CUT, government-affiliated “social movements” and student federations, were far smaller than the protests held across the country last Sunday demanding the ouster of Rousseff and the PT. Those demonstrations, like similar ones held a year ago, were dominated by better-off sections of the middle class who have been mobilized on an extremely right-wing basis. Participants included those calling for a reprise of the 1964 military coup that led to over two decades of military dictatorship. The crowd also included an openly fascist youth group as well as people calling for the fascistic American billionaire businessman Donald Trump, the leading candidate in the current Republican presidential primary, to rescue Brazil. While Brazilian workers are not participating in significant numbers in these right-wing rallies, they are likewise not joining in any major way in the demonstrations in support of the PT, whose pro-capitalist policies and corrupt politics they blame for the Brazilian economy’s slide into its worst economic crisis since the 1930s, with continuing waves of mass layoffs combined with escalating inflation that is decimating living standards. There was a brief clash at the rally on São Paulo’s Avenida Paulista Friday when a small group of antigovernment protesters raised a banner demanding Rousseff’s impeachment, provoking a surge by the pro-Rousseff demonstrators, who were repulsed by Military Police using pepper spray. In the early morning hours preceding the rally, police shock troops cleared the avenue, which had been blocked by protesters demanding the ouster of Rousseff. The cops employed tear gas, water cannon and stun grenades against the rather small band of demonstrators. Abandoning the street, they assembled in front of the Federation of Industries of São Paulo (FIESP), the country’s leading employers association, whose chief came out to greet them and subsequently provided them with lunch. 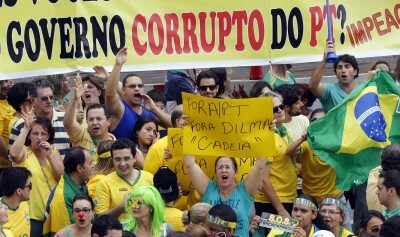 FIESP gave its backing to last Sunday’s anti-Rousseff rallies. 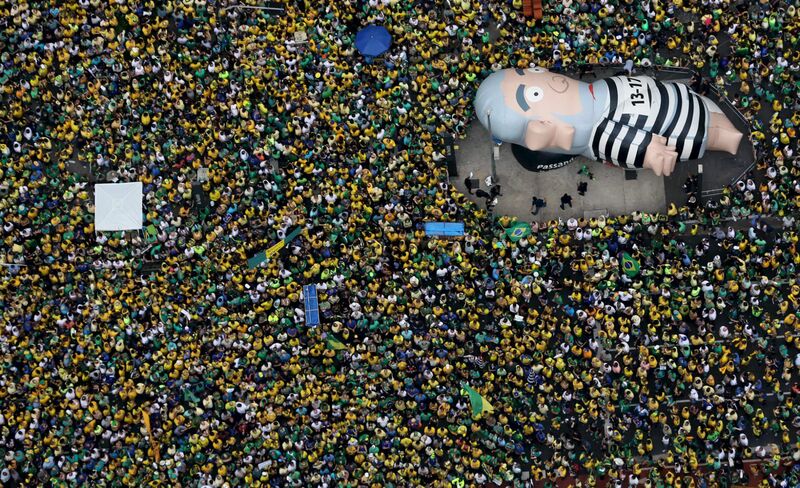 Anger on both sides of the impeachment debate was heightened—and the ranks of Friday’s rallies no doubt swelled—by the release on Wednesday of the contents of a conversation between Rousseff and Lula secretly recorded in a wiretap ordered by Sérgio Moro, the judge leading the Operation Carwash (Lava Jato) investigation into the ever-widening bribery and political kickback scandal surrounding the state-owned energy conglomerate Petrobras. Moro and other investigators interpreted the statement as proof that Rousseff was prepared to make the appointment in order to block Lula’s prosecution in a criminal court and thereby forestall any conviction and possible jail time in connection with the corruption scandal. Ministers can be tried only by Brazil’s supreme court, which provides them with greater rights and proceeds much more slowly than a regular court. Lula was briefly detained earlier this month for questioning in connection with the Petrobras scandal. He is accused by prosecutors of hiding his ownership of a seaside triplex apartment outside of São Paulo that was built by one of the construction firms accused of making political kickbacks in return for receiving lucrative contracts with the oil company. Making the release of the wiretap even more egregious was that the recording was made after the warrant authorizing it had expired. Moro has defended the release of the wiretap evidence, comparing it to the US Supreme Court’s 1974 order that Richard Nixon turn over White House tapes to Congress. Meanwhile, an impeachment committee held its first meeting Friday as the lower house of Congress convened in a highly unusual Friday session. While Brazil’s deputies and senators habitually clear out of the inland capital of Brasilia on Fridays, not to return until Tuesday, the house speaker, Eduardo Cunha has vowed to convene sessions every weekday in order to more rapidly run out the clock on the 10 days that the constitution grants Rousseff to defend herself against impeachment charges. The impeachment has been initiated on the basis of charges that Rousseff illegally manipulated the federal budget in order to maintain government spending in the run-up to the 2014 presidential election. Cunha, however, threw into the proceedings the charges made as part of a plea bargain by Delcídio do Amaral, the former PT leader in the Senate, that both Rousseff and Lula had actively participated in the Petrobras kickback operation. The 65-member impeachment committee includes at least eight deputies who are themselves facing criminal charges before Brazil’s supreme court, while Cunha himself is a prominent suspect in the Petrobras scandal, accused of funneling tens of millions of dollars to his political allies and secretly depositing at least $5 million in Swiss bank accounts. 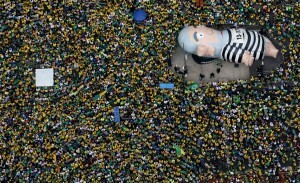 The deepening economic and political crisis has thoroughly discredited every major party and political institution in Brazil as the government veers ever closer to a full-blown constitutional crisis, with the executive, legislative and judicial branches each disputing each other’s powers.